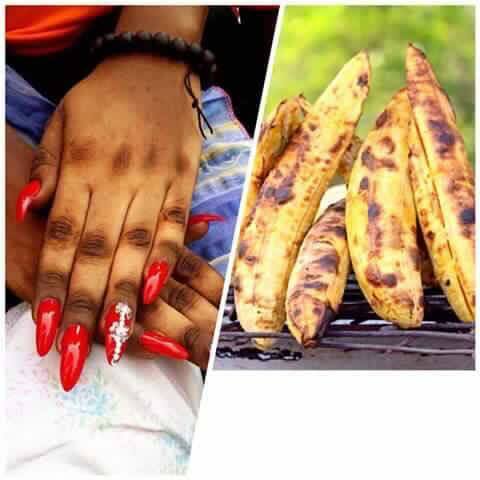 Special Forces in Amsterdam are seriously looking for a Ghanaian woman, named Auntie Gifty Kissiwaa, who roasted her fingers just to look like roasted plantain, sold by road sides of Ghana. Though it’s unclear what her crime is; it’s rumored that the Police hunt is because she might have used a dangerous chemical for her style of bleaching—and Amsterdam authorities fear she may be introducing the large bleached population of Africans out there to this toxic chemical. The woman said to be from the Ashanti Region of Ghana caught the attention of Amsterdam Police when photos of her fingers and hands were shown to a police woman from a bunch captured at a party she attended last month at Den Haag. Since launch of her hunt, Kissiwaa’s fingers have gone viral online—with the hope that she would be spotted.